As a first round judge for the CYBILS, I've spent the past few months poring over stacks of picture books. 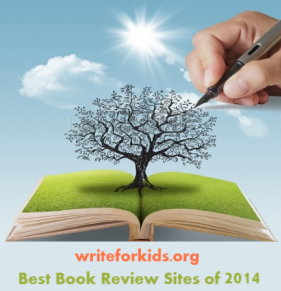 There are many strong contenders in the nonfiction picture book category this year. Planting the Wild Garden is an example of a nominated title that eloquently opens up the world of science to young readers. 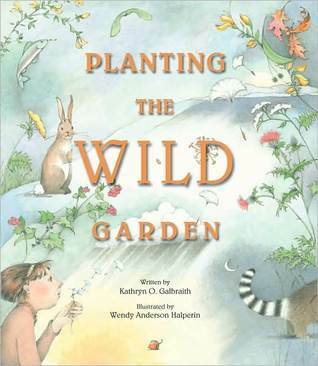 Follow the journey of seeds in nature in Planting the Wild Garden, a beautiful nonfiction picture book. Upon opening the book, readers will discover intricate seed illustrations adorning the end-papers. The first page shows a farmer and her son planting seeds in a vegetable garden. I was pleased to see the farmer in the book is female which goes against the typical picture book depiction of farmers as older men with white beards. Galbraith uses the example of the farmer planting seeds to serve as a contrast to wild seeds, which are not planted by humans. The story follows seeds in nature as they are scattered by the wind, strewn by birds, washed away by rain, and caught in the tail of a fox. Galbraith effectively uses onomatopoeia to bring the sounds of nature into the narrative. "Stomp! Stomp! People help plant the meadow too. Seeds travel on muddy boots. Hitchhike on sweaters. Snag on socks and whoosh! Sail on a puff of breath." Halperin's pencil and watercolor illustrations reflect the fragility of the seeds and nature with soft pastel colors. Panels are used effectively on a number of pages to show change over time. The gorgeous illustrations and the simple text work well together making the science concepts accessible to young readers. The seeds aren't labeled or identified, and there is no supplemental information about seeds in the back of the book. That's because the book isn't meant to be an intensive study of seeds. 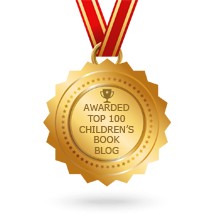 Its purpose is to introduce young children to how seeds travel and grow in the wild, and it would make an excellent read aloud. Planting the Wild would also pair nicely with A Seed is Sleepy by Dianna Hutts Aston. Children and adults who are inspired to learn more about seeds should consult the extensive bibliography in the back of the book. This would be a lovely book for elementary school aged kids to ponder over - it seems to have a dreamy, naturalistic quality to the way the narrative and pictures unfold. Thanks for sharing! I love the soft illustrations from the book cover - if this is any indication of what's inside the book, I'm sure it'd be a good read. Thanks for joining this week!